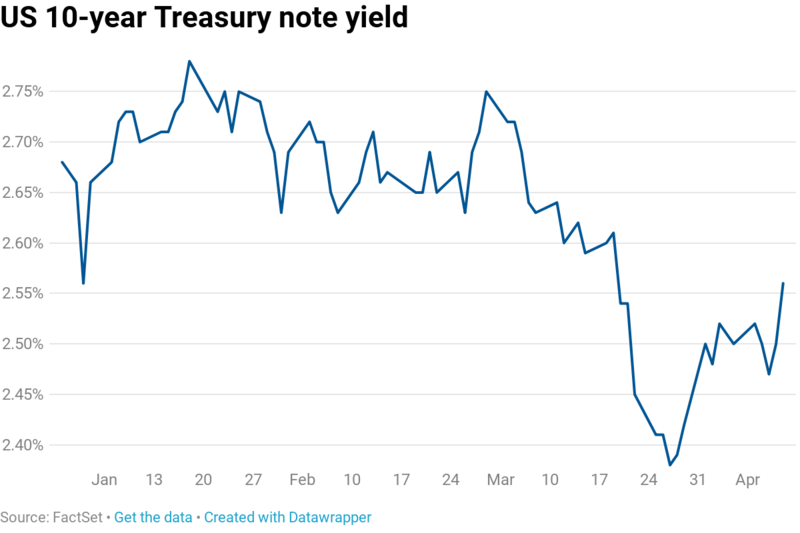 U.S. government debt yields followed international rates higher Friday as investors in the United States pivoted toward riskier assets on the week’s final day of trade. Much of the weekend optimism stemmed from new economic data that showed Chinese bank lending was on the rise in March and that the country’s trade surplus soared beyond analyst expectations. Dollar-denominated exports during the month of March rose 14.2% from a year ago, surpassing forecasts of a 7.3% rise from a year ago, according to a Reuters poll. The better-than-expected economic data helped quell some traders’ angst over the ongoing financial slump in China and helped buoy stock indexes around the world given Beijing’s influence in international markets. Clarida’s comments came a day after the FOMC released minutes from its March meeting, at which the Fed adjusted its forecast to no rate moves this year. The minutes reflected a central bank that will watch data closely this year, with some members leaving open the chance of a rate hike if conditions continue to improve.